It is now eight years ago since Molly witnessed the abduction of a little girl in a Walmart parking lot. Molly has had the hardest time getting over this traumatic situation, as she felt she could have done more to help this little girl. Molly, her husband Cole, and her son, Erik, decided to move away from Philadelphia, the town where this occurred eight years ago, to a new town, called Boyd, for a fresh start for Molly. Here they are making a new life with new people, a new home, and new surroundings. Molly wasn’t running away from what happened, but it was a part of her and of the families healing, as it had affected them, as well, with Molly’s distress. Every morning Molly goes for a run through the woods. This one morning she had a vision of a little girl named Tracey being abducted. When Molly returned from her run, she found out it was true, and “The Knowing” was back. The visions were back. This book takes us through all of the search efforts to find Tracey. No one could find her, and Molly continued having “The Knowing” haunting her. She kept getting visions of Tracey over and over as to what was happening to her, but couldn’t quite make the details out clear enough. Molly was being hard on herself about seeing the abduction back in Philadelphia again, and made a pact with herself this time she was going to try to help more with this abduction of Tracey. This time she was not going to keep so quiet about what she saw and knew. The visions kept coming to her. She couldn’t make them out clear enough yet to be able to tell exactly what and where Tracey might be. Molly did eventually go to the police and told them a little bit of what her capabilities were. She was laughed at by some, but taken more seriously by one of the Officers. This story twists and turns and goes in every different direction than what you might expect it to go through. I thought I knew who the abductor was, and how the entire story plays out. I was completely fooled and shocked as the story unfolded and all the answers came out. 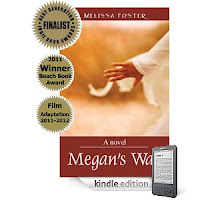 Melissa Foster’s masterful writing talent weaves a story that pulls you in and keeps you reading right to the end. You can’t ‘just’ put her books down because you want to know how everything unfolds. This book ‘IS’ a “Can’t Miss” read! I received this book for “FREE” from the Author, Melissa Foster, in exchange to read this book and write a review about it. It is NOT required for my review I write to be either positive or negative, but, “of my own opinion.” I was NOT provided with “ANY” monies to accept this book, “NOR” to read it, NOR were “ANY” monies given to me to write the review for this book. All that was ‘expected’ of me was to enjoy the pure pleasure of reading it. Again, the opinions expressed for and about this book are ‘of my own opinion’. I am disclosing this information in accordance with the Federal Trade Commission’s 16 CFR, Part 255, http://www.access.gpo.gov/nara/cfr/waisidx_03/16cfr255_03.html Guides Concerning the Use of Endorsements and Testimonials in Advertising. Click on the Amazon Link Above, the one next to my review and purchase your copy today of "Chasing Amanda" at ONLY $2.99! OR, to enter the GIVEAWAY of this book, GO HERE: http://lauriehere.blogspot.com/p/mothers-day-contest-enter-here.html and scroll all the way to the bottom, and I mean THE "BOTTOM" OF THE PAGE to "FILL OUT THE FORM" TO "ENTER" THE GIVEAWAY! Click on the Link and feel FREE to download this book for FREE! Thank you, Melissa!!! 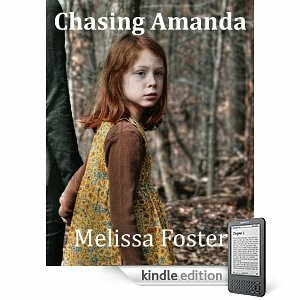 MY BLOG TOUR STOP FOR "CHASING AMANDA" IS TODAY, AUGUST 4th to August 7th till 11:59 pm to ENTER THE GIVEAWAY FOR 1 EBOOK COPY OF "Chasing Amanda" by Melissa Foster!!!! Make sure to enter!!!! Thanks to EVERYONE who always comes by and enters my Giveaways!! I notice your names on the entry forms as I do the drawings, while verifying that you 'do' follow me and also if you want to be subscribed to my email list!!! YOU ALL KNOW WHO YOU ARE!!!! A 'HUGE' THANK YOU FOR YOUR CONTINUED SUPPORT!!!!! IT'S VERY APPRECIATED!!!! ALSO, a "HUGE THANK YOU" TO ALL THE 'NEW' PEOPLE WHO HAVE COME BY FOR THIS BLOG TOUR!!! I WELCOME YOU!!! Please feel free to look around and have fun! Melissa Foster is ALSO the Founder of the website FOR WOMEN ONLY CALLED: http://www.thewomensnest.com I HIGHLY encourage you to become a member there! It's a wonderful website by women FOR WOMEN! "MEGAN'S WAY" and "CHASING AMANDA" have won 5 new Finalist awards from Readers Favorite! Go to: http://bit.ly/qMYeXl and check it out! Thanks, Laurie! LOVE your site! Thanks SO much, Melissa! It means a lot! I'm glad you like the post, too!